Citizen science monitoring data from August and September 2017 are now available online (excepting three September samples still in process). These data continue the slow upward trend in cesium-137 concentrations that began in February 2015, when a coastal sample first tested positive for the Fukushima fingerprint isotope, cesium-134. The highest concentration from these two months was 3.5 Becquerels per cubic meter (Bq m-3, 1 Bq = 1 Becquerel is one radioactive decay per second, named after Henri Becquerel who discovered radioactivity) collected from Sandspit, Haida Gwaii on August 31. After last month’s update, we realized that it had been a while since both the oceanic and coastal monitoring data had been represented on the same figure. This may be found in the animation, on the right panel, following the September 2017 data. This log scale plot, with the maximum observed concentration during each of the oceanic monitoring cruises, highlights the time delay that has occurred between the peak of the contamination plume offshore and the peak of the signal in coastal waters. 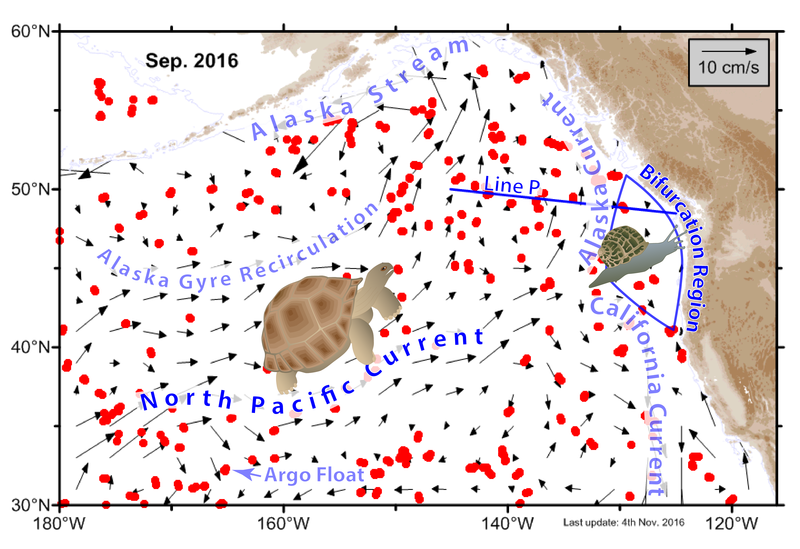 Again this is the result of the waters slowing from tortoise speed to garden snail speed as they approach the coast and the North Pacific Current splits into the northward-flowing Alaska Current and the southward-flowing California Current. Also on this scale (in the grey bar) are the levels that were observed during the 1960’s atmospheric weapons tests and the Action Level according to Health Canada (10,000 Bq m-3 is the top of the red section). You can see that levels currently observed pose no known significant health risk to humans or the environment. While the offshore monitoring effort expects that concentrations will continue to decrease in those samples collected still in processing from 2017, Our Radioactive Ocean, our US monitoring partners measured a December 2017 sample from Mukilteo, Washington (just north of Seattle) that was considerably higher than anything InFORM has yet seen within the Salish Sea. At a concentration of 4.6 Bq m-3, this sample is 3x the most recent InFORM results from Port Renfrew, Victoria, and Salt Spring Island. It will be interesting to see if this one sample will serve as a foreshadowing for a pulse of plume water infiltrating into the Salish Sea over the fall of 2017. Fall is also the time of year when weak tidal currents leads to reduced mixing in the estuary. As the plume nears the coast, reduced mixing could allow the plume waters to transit the Strait of Juan de Fuca at depth with less influence of radiation-free river water than at other times of year when the currents, and mixing forces, are stronger. We look forward to the data from the rest of the fall 2017 samples to see what sort of signal may develop. Dr. Jonathan Kellogg at the Ocean Sciences meeting in Portland, Oregon. When communicating risk, it’s always a good idea to match your science :-D.
InFORM’s Dr. Jonathan Kellogg presented two posters at the Ocean Sciences joint meeting between the American Geophysical Union, the American Society for Limnology and Oceanography, and The Oceanography Society which was held in Portland Oregon mid-February. The first poster addressed the scientific results from InFORM monitoring and largely presented the February e-newsletter to science colleagues. The second poster focused on the many lessons we have learned from communicating with all of you. The public outreach aspect of the InFORM project and comparatively rapid turn-around of interpreted data to the public is still rather rare in the marine sciences. We have learned much in our efforts to communicate the risks associated with Fukushima contamination and the challenges of establishing trust in an era when false interpretation of observations is abundant. Communicating the science of a topic with two very passionate and polarized perspectives between the pro- and anti- nuclear advocates has definitely come with its own challenges. That said, we have genuinely enjoyed presenting the data over the last three years to any and all who are searching for an evidence based status update on the Fukushima plume. The meeting provided an opportunity for many of us working on the project to come together and, in some cases, meet for the first time. While we communicate via email and phone regularly, there is still a benefit to those rare face-to-face interactions in continuing a good working relationship. Meteotsunami (tsunami up to 1-2 m generated by meteorological phenomenon) are way more common than previously thought. In the Great Lakes there may be over 106 such 0.3 m (1 ft) waves each YEAR! That said, only 1 wave per year is likely to be above 0.85 m, and 1 wave every twenty years may be as large as the 1.3 m deadly meteotsunami that struck Chicago in 1954. An examination of the carbon cost to develop planned tidal power generating sites over the entire project lifespan reveals that few sites would be less carbon intensive than coal. This cradle-to-grave analysis should be considered as society is trying to curb its dependence of fossil fuels since it may reveal unforeseen complexities. Northwest coastal communities have every ability to adapt and mitigate the effects of climate change according to a study that examined expected policies affecting population growth and changes in land use in light of sea level rise and projected climate variability. Of course, the study also revealed that some management actions will likely make adaptation considerably more difficult. Decision makers should be encouraged to adequately plan now to ensure the best possible outcome for the future.